I know, I know, I said "no more patterns" a while back, but frankly, I don't think any of you thought I meant it. I certainly didn't. 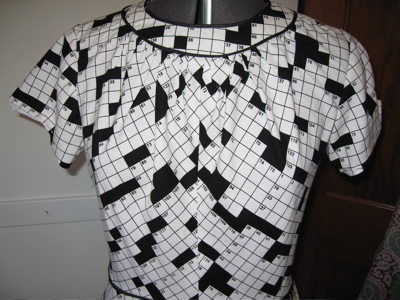 And how could I hold to that resolution, when confronted by this pattern, from eBay seller ? Sorry no dress yesterday; it was my first day teaching (a class on dictionaries at ) and I wanted to be overprepared. (I think I missed overprepared and skewed right into "brain dump" but we'll see.) I'm also going to be scarce here until at least next Tuesday; we're taking off tomorrow for a family visit and I'm toying with the idea of Not Bringing My Laptop Along. It's scary (well, not too scary, I can check email on my phone) but the point of vacation is to vacate, yes? 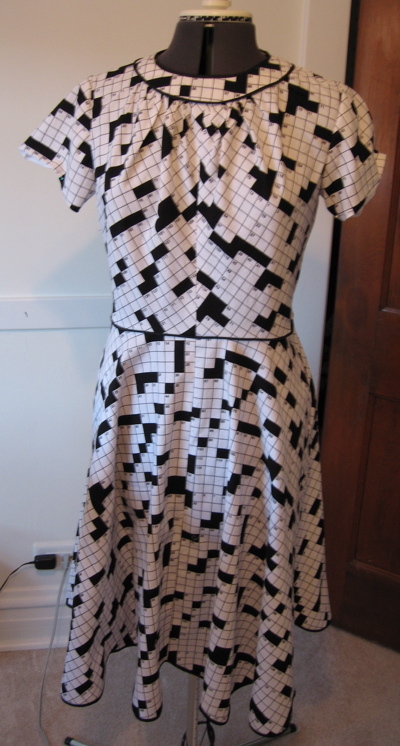 I'm not a huge fan of this style of dress, but the fabric … I *REALLY* want this fabric. I really want about five yards of this fabric! I've been looking for ginkgo fabric . So why am I wearing this dress (RIGHT NOW, I'm wearing this dress) at the ? Well, it's complicated, but it boils down to "I'm working for some folks making a words documentary and they got me to talk puzzle-guy-extraordinaire into making a crossword with a bunch of underused words in it for me, and they're filming people solving it tonight." Of course, once I knew I would be attending, the important question was "what will I wear?" Then I saw and, well, I *never* turn down a chance to make a stunt dress. Are you unsurprised, as I was, to learn that the V&A website has a whole section on ? It's a good one, too (also unsurprising) and traces the initial demise of the pocket and rise of the handbag to the radical change in women's fashion of the 1790s, when dresses became too narrow to admit of the wearing of separate pockets tied around the waist under the dress. Because of this, women began to carry little bags, called reticules, which accommodated much less than the capacious separate pockets. Kate (of ) sent me this link to yet another company making dresses out of food (remember the ?). This one is from Wish-Bone, to promote their new sprayable salad dressings. I did almost bail out of watching the video when I realized it was hosted by Richard Simmons (my , in a move to encourage poor body image, eating disorders, and self-loathing among adolescent girls, had us do his in gym class. Many years later, in a fit of Stockholm Syndrome-induced thrifting, I bought a copy of that LP, which will really come in handy if I ever need to blast it from speakers to make teenagers or Noriega or whoever get offa my lawn). Robin sent me this link, from . This is a dress of , and was worn when she was matron of honor (!) along with Elizabeth Taylor (!) at in 2002. Leaving aside my (although this falls under the Bridesmaid Exception, to be sure) I'm not sure I'd ever wear this (not that I'd ever get the chance, it's both $4K and a size 6) unless I was trying to costume a play in which all the characters were animated gothic furniture. Although maybe if I were in a wedding where the best men were Michael and Tito Jackson, I'd just say "what the hell!" and go for it. Luckily I've never been in that situation. Who among us knows what we'd choose at that point?